Dr. Ernie Ward lists seven great (and perhaps unexpected) ways to help your pet lose weight. For more from Dr. Ward, find him on Facebook or at www.drernieward.com! According to the latest veterinary surveys, over half our nation’s dogs and cats are overweight. This means almost 80 million pets are at risk for developing crippling arthritis, debilitating diabetes, catastrophic kidney and heart disease, high blood pressure and many forms of cancer. How can you slim down your super-sized pet, keep them fit and reduce their risk of developing many serious diseases? The answer may be easier than you think. Try these seven tips to trim excess pounds from your pet and keep them trim. If you don’t know how many calories your pet needs each day, you don’t know how much to feed. And don’t think you can trust the bag; feeding guides are formulated for adult, un-spayed or un-neutered active dogs and cats. That means if you have an older, spayed or neutered indoor lap potato you’re probably feeding 20% to 30% too much if you follow the food’s instructions. Instead, ask your veterinarian to calculate the proper number of calories your pet needs each day. Another good starting point is to use this formula: Divide your pet’s weight by 2.2. Multiply this figure times 30. Add 70 and you’ve got a general idea of how many calories you should be feeding a typical inactive, indoor spayed or neutered dog or cat weighing between 6 and 60 pounds. ** [(pet’s weight in lbs/2.2) x 30] +70 ** Of course, each pet’s metabolism is different so be sure to consult your veterinarian before starting a diet. A pet parent’s single greatest tool in the fight against excess weight is a measuring cup. Too many pet owners simply fill the bowl or “guesstimate” how much they’re feeding. Even worse, some pets, especially cats, are fed an “all-day buffet” that results from the “just keep the bowl full” feeding method. The Association for Pet Obesity Prevention has done studies to show that feeding as few as 10 extra tiny kibbles of food per day can add up to a pound of weight gain per year in indoor cats and small dogs. After you calculate how many calories your pet needs, determine how much food you should feed each meal – and measure it. First off, I’m not anti-treats. I am anti-junk treats. If you’re going to give your pets extra goodies, make ‘em count. Too many pet treats are what I call “calorie grenades” laden with sugar and fat blowing up our pet’s waistlines and destroying their health. Choose low-calorie, no-sugar goodies that provide a health benefit. I like single ingredient treats such as sweet potato, salmon, and blueberry bites or functional treats that provide a bonus such as helping to keep teeth clean or promote mobility. Whatever treats you give, be sure to count those additional calories. Many pet owners feed the proper amount of food but sabotage their efforts by adding one or two snacks throughout the day. As few as 30 extra calories per day means your pet gains over three pounds in a year. Better yet, dogs don’t do division. Break treats into peewee pieces and divvy them out whenever your pet earns it. Be cautious of “guilt-treating” – the practice of giving your pet a treat because you feel guilty leaving them home alone. Instead, use treats only as a reward for good behavior. Pets (and people) need to learn to earn extra goodies. As an alternative to highly-processed store-bought treats, try offering baby carrots, green beans, celery, broccoli, cucumbers, sliced apples and bananas or ice cubes. These naturally nutritious tasty tidbits are a healthy option for many dogs. Be sure not to feed dogs a full apple or banana, as they have high sugar content. For cats, try a flake of salmon or tuna when you’re feeling generous. While you’re at it, put down the potato chips and share a carrot with your pooch. You’ll both be healthier for it. When it comes to living a long, pain-and disease-free life, research proves our most powerful partner is daily exercise. Speaking of partners, anyone with a dog has a built-in, no-excuse exercise buddy. For dogs, as little as 20 to 30-minutes of brisk walking is all it takes to boost immune function, improve cardiovascular health and reduce many behavioral problems. For cats, try playing with a laser pointer, remote-controlled toy or ball of paper for 5 to 15 minutes each day. Do yourself and your dog a favor and commit to daily walks, rain or shine. The health benefits of walking extend to both ends of the leash. A couple of supplements may help keep your pet (and you) fit and trim. 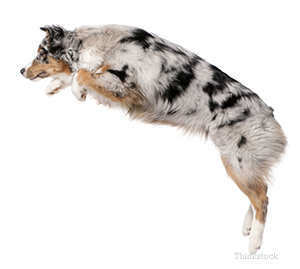 Almost every dog, cat and person can benefit from taking a daily omega-3 fatty acid supplement. These powerful fish oils pack a potent anti-oxidant punch that has been proven to help prevent and treat numerous diseases. In addition, they may help ease achy joints and perhaps encourage weight loss. L-carnitine has been shown to aid weight loss and promote lean muscle mass in some studies. I’ve been prescribing (and taking) l-carnitine for over 13 years and been impressed with the results. Ask your veterinarian if either (or both) of these supplements make sense for your pet’s condition and which ones are good quality. Most of the pet dogs and cats I treat for don’t need a high-carbohydrate diet. Yet that’s exactly what most of us feed our pets. Many diets contain 60% or more carbohydrates when you analyze the food label. I suggest diets that have balanced protein and carbohydrates. As a general rule, I recommend trying a higher protein / low carb diet first for weight loss in my patients. Be sure to check with your veterinarian before making any diet changes. Pets with certain conditions, such as kidney failure, may do better on a different type of diet. It’s the responsibility of each of us to help our pets maintain a healthy weight. Just as you’d never walk your dog without a collar and leash or allow them to eat only pizza and ice cream (which many dogs would LOVE! ), it’s up to pet owners to feed healthy, nutritious foods and treats and exercise daily. By using these seven simple suggestions, you’ll be on your way to your pet’s best – and healthiest – year yet! For additional information, visit www.PetObesityPrevention.org or www.DrErnieWard.com. Join the conversation at www.Facebook.com/DrErnieWard.